Hi-Tech Seals shall distribute and/or manufacture a quality product that will meet our Customers' requirements and expectations. 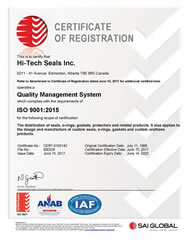 Hi-Tech Seals shall strive to continually improve the effectiveness of the Quality Management System. Hi-Tech Seals Quality Policy shall be communicated and understood at all levels of the organization. Hi-Tech Seals Quality Policy and Quality Objectives will be reviewed for effectiveness and accuracy during the Annual Management Review.